This page was added on 07/03/2011. When you see what shops still retail at the Hyde, have things really changed apart from the people running them ? We moved to Shephall (Baddeley Close) back in 1964 from London and down the Hyde you could get everything. Have your hair cut, have your hair done, a couple of Newsagents, the Bank, the Cafe- used to have our Dinners there during the school holidays, my Parents had an arrangment with them, also with George the Barber too. The Co-op was there and still is, Foxes stood Opposite, had a Saturday job there. The manager was called Alan and he used to take me to watch evening games at White hart Lane. I moved abroad in 1977 but come back 3 times a year and always find a reason to get something down the Hyde. I remember the Hyde well when I grew up in Shephall as a young boy in the late70’s and 80’s. I had many a haircut at the Barber’s (cant recall the name of the Barbers, but it was set back from the main part of the Hyde to back and left of where the Chinese was). Was sent by my mum many a time to collect a Chinese. Bought probably countless sweets at both of the newsagents too. Also remember buying a copy of the book “A District Nurse” at the newsagents near the church in the mid-80s, after watching the TV series of the time (I must have been around 1984, and I’d be 10 or 11). Strange what you remember! The Co-Op was a regular store too; mum used to drag us with her to pick up items, or as we got older, send us to get them for her! Butchers/greengrocers too. I think there was a Londis opposite the Co-Op too. I’ll have to make a trip back to Stevenage one day to have a look at what everything is like now! Before the Chinese was there, which I think is still open, I went to school with a girl whose dad had it as a cafe which had bi-fold doors so you could extend the tables onto the pavement when the weather was nice. If memory serves her name was Susan Casson. There were two greengrocers, one Edwards I believe, next to fish shop owned by Rowes, and the other up the opposite end near the church. Bike shop, got my first one with stabilisers there (! ), chemist where two of the ladies who worked there were twins, two grocers, dress shop where mum bought a lot of clothes for me and herself. Two butchers as well I think, similarly like the greengrocers up either end of the shops. I was probably the boy with the “penny for the guy” sign. 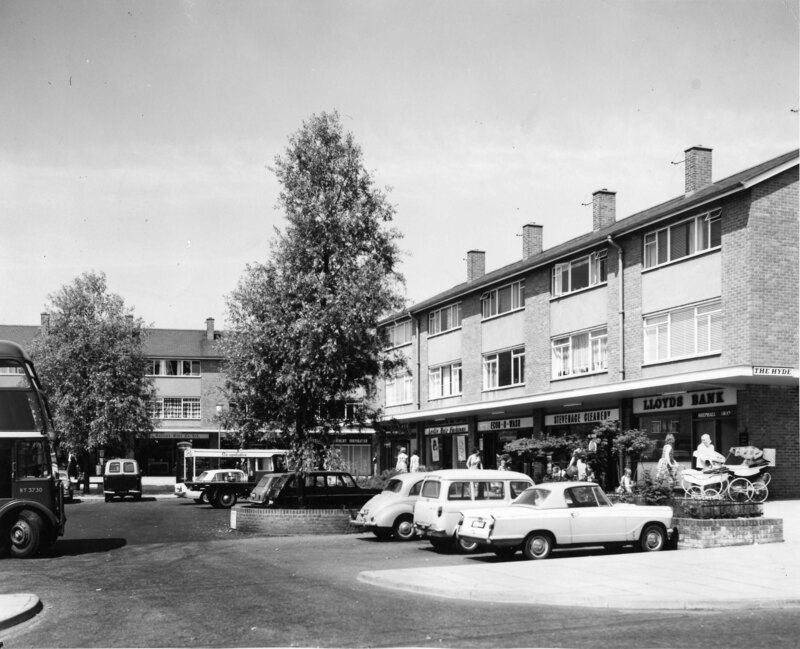 I moved to Stevenage with my parents and older sister in 1959 and lived in Bandley Rise. I went to Bandley Rise infants and junior schools. In 1964 I went to Barnwell school. I remember going to the shops at the Hyde for my mum, and seeing a boy wanting some pennies for a guy for fireworks night, gave him some of my mum’s pennies change. She was not happy with me at all! Does anyone remember a robbery at the bank in the Hyde? I think my dad may have seen the robbers at some point. We lived in Stevenage until 1966 when we moved down to Wiltshire. One of my mum’s friends (“Auntie Pam”) worked in the baker’s shop, and if she saw me on the way home from school, she would call me in to the shop and gave me a cake to take home. I can remember the toilet block at the Hyde… I think the hairdresser was once Raymond Leslie, which later changed to Shades. I also remember the Launderette, the butchers, greengrocers, and Pearces Bakers. There was also a music shop and pet shop, and my Mum worked in Wests Hardware shop, which later became the Indian Takeaway. Lloyds bank turned into a Doctors surgery. Martins Newsagents, near the rent office, was my favourite as a child, I used to get my 10p mixtures in there..I also remember the lolly pop man, he did that job for years. Awww those were the days. I moved away from the area a few years ago, but the Hyde was a very different place to when I was a child.. I have fond memories though. I can remember Martins Bank where Lloyds bank was and at the end of that block there was a cafe. The Hyde – What do I remember of the first shops there? First during building there were the Huts and Caravans ranging from Newsagents, that was Greenhalghs, to the Barber that was Mikes. The DIY was Elmes and the Coop also had one I believe. They all moved in to the brand new shops as and when theirs were completed.Once the shops were completed I recall that there was Fox’s the Grocer ( opposite the Coop) Furr Bos. Fish & Chips; the Galleon Wine Company Off Licence. Baileys Newsagents had the post office facility. There was also a Ladies Hairdresser but can’t remember the name. Lloyds Bank seen in the picture above were also there in the days when Banks closed at 3:00pm. The Buses used to pull in to the car park – a lot less cars then! The Fold PH, an Ind Coop house, opened soon after the shops I recall. There was a Butchers shop and a Chemist nearby both opposite Greenhalghs – every class had a lad that went off to be an apprentice Butcher in those days. The “Corporation” also had a rent office. and there was even a Public toilet in the days when it could be relied on to find hot water and soap and clean surroundings. There was also a Chinese at the end of the Bank row of shops. I have forgotten a few but my abiding memory of those days in early sixties was that these neighbourhood centres provided a vital service in those days compared to what we see now. The Hyde, during the evenings, was a significant gathering place for the Scooter riders of the sixties and I regularly recall the regular moving on by the “Beat” Policeman if there were too many of us upon which we normally went home at the second asking. Happy memories of days now in the archives of time.